I have designed miniature computers for personal energy and activity monitoring for many decades. 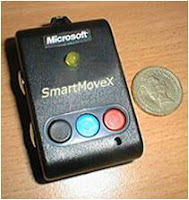 One below for Microsoft Research was an accelerometer, radio beacon and data logger, around 2001, SmartMoveX here. Research was with Microsoft Research John Krumm, Greg Smith, paper here. This later got transformed into device with a camera, Sensecam as here. The University of Dublin have recently started some research with SenseCam on Carbon Footprints. Last year I proposed a device for personal energy monitoring for medical uses that was very small, unobtrusive and could be used and worn 24/7 with no battery change etc. It is like a "well being" badge that display's personal activity in the day. The above sensing badge with paperclip ( real size model ) is a prototype, it has 3 axis accelerometer, data logger, 32Mbytes FLASH memory, radio transmitter, and tiny thermal camera 4x4 pixels and activity lights. It is a development of a SenseBulb I designed for Assisted Living but much smaller. SenseBadge lasts about a week before battery change and upload of data to PC as a graph. 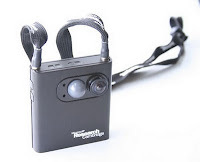 As well as recording personal movement and exercise, the thermal camera can record ambient temperature, but also capture simple 4x4 pixel thermal image in front of person, i.e. record the time person in front of a stove, TV, eating, PC, human. These home appliances have a thermal signature that can be captured. Unlike normal digital thermometers, thermopiles captures very fast temperature changes, around 100 times/ second, see below 4x4 colour map. As the data is time stamped it can be synchronised to camera images and GPS. As the thermal signatures are fairly simple they can be interpreted and classified using a computer, e.g. Excel, rather than complex image processing. Themopiles also avoid the problem of conventional temperature sensors worn on the body, these reflect the temperature of the users body (not ambient temperature) as wearable badge warms up , e.g. as on SenseCam. Unlike passive data loggers, this one has optical feedback (LEDs changes colour) to provide rolling history of how much energy is consumed or wasted in the day. Every person you met that day will know at a glance if you have been a couch potato (or ill), sat behind a PC, eating, or "chronically busy" person ;-). You can walk into a meeting and people can glance at you for status update. As badge detects and records proximity of people, you don't need to say sorry, been busy "been in meetings all day" as display can show that at a glance. A download at end of day can classify percentage of time spent in each activity, e.g. time spent with other people. A sequence of spinning LEDs on badge speed up based on "busyness" measurement of last few hours. This can be useful in medical care of patients in a hospital to check if they are being cared for, e.g. accident and emergency , "lying flat on trolley for 2 hours and unattended". Executives would like it as faster spinning of LEDs might indicate "importance". Some people say, well that can all be done with a mobile phone, but they are not fitted with simple thermal cameras (which can reveal more than optical cameras and accelerometers ), the badge is very low powered and can be worn at night. Badge also gives visual feedback of a rolling summary of the day's history of activity. Image of UK Prime Minister who might need a BusyBadge. LED array for real time display of day's history of events, red, orange, green, blue, white, flash frequency indicates activity. The practical side, Girton Labs has implemented all the components of this, i.e. hardware, software, algorithms, pcb, CAD case. The applications range from personal energy monitoring, medical applications, Assisted Living.